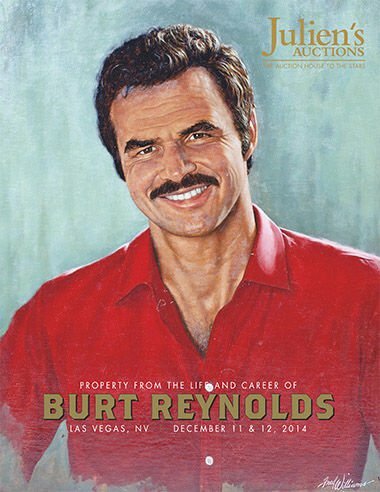 The catalogue for the 2014 auction of Burt Reynolds' stuff. Author’s note: Still reeling from the death of Burt Reynolds -- Smokey could not catch the Bandit, but time could -- I found myself unable to concentrate on a new column this week. I did manage to rustle up this Burt-themed work from 2014 as the actor prepared to auction off some of his belongings. Please enjoy this lightly edited repeat. Burt Reynolds has a lot of stuff, but he will have less stuff when Julien’s Auctions in Las Vegas sells off more than 600 items from the life and career of the mustachioed screen legend, who may or may not need the cash. Some have speculated Burt is broke. Burt insists he is not. "I want everyone to know that contrary to what all the news outlets are saying, I am not broke," he told ET online. "I have been dealing with a business dispute for many years as well as a divorce settlement. I am simply selling some of my memorabilia that I have enjoyed for so many years but do not have use nor room for them anymore." The top prize for any collector would be Burt’s “Smokey and the Bandit” 1977 Pontiac Trans Am coupe. The auction house estimated the car would bring in as much as $80,000. As of this writing, the online bid was $110,000, which would be close to the upper limit of my price range if I had a spare $110,001 lying around. But what are some of the more affordable items from the life and career of the man who took his pal Ned Beatty on the worst camping trip ever? How about a tuxedo jackets, estimated to sell for between $200-300? Wait, how did Burt end up with the late “Kung Fu” actor David Carradine’s tuxedo jacket? I assume Carradine left it hanging on the back of Burt’s armchair made of antlers (estimated price, $600-$800) after Carradine dropped by Burt’s home to take a look at his newly acquired mounted Kodiak brown bear ($2,000-$3,000) “in a dangerous pose,” something that mutual friend Dom DeLuise had been raving about at a cocktail party. “ I’m not sure which house is yours,” Carradine tells Burt on the phone. Burt explains his is the driveway with the life-size sculpted bronze dog statue ($1,000-$2,000) out front. And that’s just what they did. Burt donned his monogrammed Everlast boxing robe ($400-$600) and the two locked arms on a 19th century mahogany double pedestal partner's desk ($2,500-$4,500) that once belonged to film director John Ford. Burt won, of course, just as he won the 1977 People’s Choice Award for Favorite Motion Picture Actor ($400-$600), and the rest is history – history that will be on the auction block.